You can extract specific information and data from any web pages by running a custom extraction with DeepCrawl. This can be useful if you need to check your analytics or social tagging or for extracting backlinks and product data. 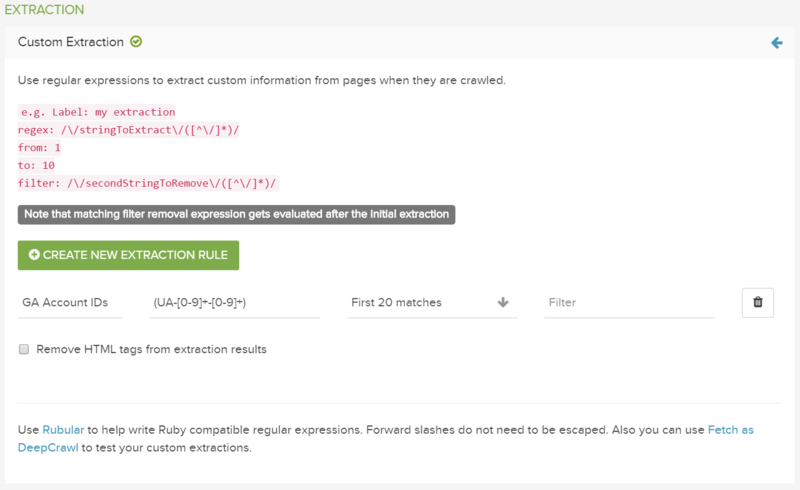 Write or copy/paste your customised regex rules into the Custom Extraction option, in Advanced Settings. After you run a crawl with the custom extractions set, you will see a new reports available with data in the section called 'Extraction'. The 'Extract' report contains all the URLs that matched at least one of the custom extraction rules. The 'Extract Complement' report contains all the URLs that didn't match any of your custom extraction rules. There is an individual report for each of the 30 available extractions.